A roaring beast of a pedal that will add two channels of Brit-style driven amp distortion to any amp. Two channels for different gain amounts. Presence knobs are a little fiddly, but you’d probably set ’em and forget ’em anyway. The Marshall amp sound has inspired many boutique manufacturers, one of which is US-based Friedman, which not only produces a range of amp models offering various takes on the ‘M’ theme but also offers up distortion pedals based on those amps. One of Friedman’s popular models, the 100-watt EL34-powered BE-100, spawned the BE-OD pedal a while ago. 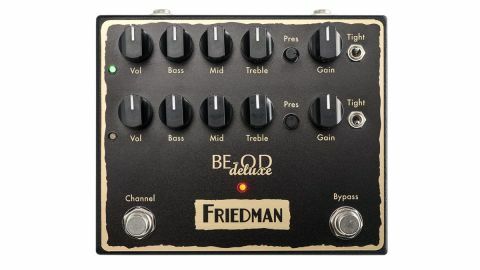 Now, Friedman has come up with a Deluxe version that puts two variations of the original pedal in a single housing, effectively creating a twin-channel M-style amp-in-a-box pedal. Each of the BE-OD Deluxe’s two channels has an identical set of controls. Where the original single pedal had a knob to set the tightness of the sound, effectively rolling off bottom-end for less thump, that’s replaced here by a three-position toggle switch. Overall tonal flexibility has, though, been enhanced by the addition of a Mid knob. Friedman says that Channel 1 is identical to the original pedal, while Channel 2 has been voiced with lower gain suggesting a two-stage dirty and dirtier or rhythm/lead approach. However, if the default overall amount of gain on each channel doesn’t suit your needs, there are internal trim-pots with both upwards and downwards movement - useful to set your ideal contrast between the two channels. The authentic amp-like sounds range from gritty M-flavoured raunch through to balls-to-the-wall distortion. Lower gain settings dial in a vintage Plexi flavour, while up the scale you’ll find a more modern master-volume-amps vibe with loads of harmonics. The Treble and Presence knobs work together in adjusting the pedal’s voice to work with a wide range of amps (as we found getting our small Fender combo and AC30 cooking with hard rock and metal sounds), and the midrange knob is influential in giving you that little extra so that the guitar doesn’t disappear in a band mix. As for the Tight control, there’s a lot of bottom-end in the pedal if you want it, but the two positions do really tighten things up, losing any flubbiness and keeping it solid, especially useful if you’re using dropped tunings.